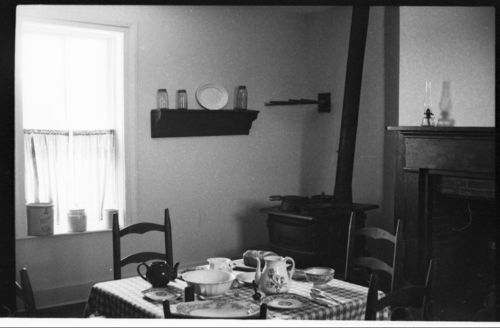 This is an interior view of the dining room at Grinter Place, Wyandotte County, Kansas. Built in 1857, it is the oldest home in Wyandotte County and overlooks the historic Delaware Crossing on the Kansas River. Grinter Place, a two-story brick house, was built and owned by Moses and Annie Grinter. He operated a ferry across the Kansas River and from 1855 to 1860, Grinter owned a trading post, that sold about one hundred sixty types of goods including clothing, powder and bullets, perfume, sugar, and scissors, among other things to the Delawares in exchange for cash and furs. The Grinters also farmed, raised poultry and livestock, and planted an apple orchard on their farmstead. Through the assistance of the Junior League of Kansas City, Kansas, and the Grinter Place Friends, the State of Kansas acquired the site in 1971 and now the Kansas Historical Society administers the former Grinter residence as a state historic site.